This supplement is a combination of B Vitamins, Vitamin D3 with mineral as CCM – which contains ingredients that help in the development and maintenance of healthy bones. Calcium intake, when combined with sufficient vitamin D, a healthy diet, and regular exercise, may reduce the risk of developing osteoporosis. This supplement also provides adequate folate which, along with other ingredients, helps to form red blood cells. It is an advanced bone health formula providing nutrients that are fundamental for mineral deposition in bone and for regulating the excretion of minerals. These nutrients are very important for those with osteoporosis, osteopenia or a history of bone fractures. 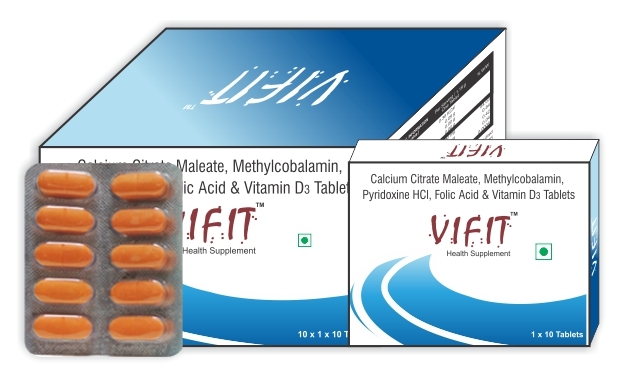 Calcium citrate-malate is the most absorbable vegetarian form of calcium, and vitamin D2 is a vegan form of vitamin D that is extracted from soy. It provides all the nutrients known to benefit bone health, helping to reduce calcium loss and maintain bone mineral density. Calcium is the main mineral found in bone, and calcium citrate-malate is the most quickly absorbed form. Although calcium citrate-malate contains only about 26% elemental calcium, it is one of the most well absorbed forms of calcium. The special structure of calcium citrate-malate makes it 6 to 9 times more easily dissolved in the stomach than plain calcium citrate and is absorbed 36% better; and calcium citrate is absorbed about 22% better than calcium carbonate. These statistics illustrate the superiority of calcium citrate-malate over both forms. Bone health is important for adults of all ages and activity levels, and it can be dependent on many factors including heredity, diet, exercise and lifestyle. Bone density loss, or osteoporosis, is a definite health problem. The problem of bone density loss with resultant deformities and fractures associated with old age is a problem that terrifies and terrorizes women as they approach and pass menopause. Vitamins D serve to enhance the body's absorption and usage of calcium, helping to prevent osteoporosis. Methylcobalamin and folate help reduce homocysteine, a metabolic byproduct that is thought to be toxic to bone fibers and pyridoxine plays vital roles in numerous metabolic processes in the human body, such as nervous system development and functioning. Vitamin B6, Folic acid with Mecobalamin has ability to regenerate health and well-being. These nutrients play a role in supporting joints and cartilage. Besides forming strong bones and teeth, and preventing osteoporosis in older people, these supplements used by every human body organ, in nerves, muscles and the heart; it is vital to all bodily functions. People who have weak and brittle bones, and are prone to frequent fractures may consume these supplements. Also, people who do not consume enough calcium in their diet due to their busy lifestyle should go for these supplements to fulfill the nutritional gap in their diet. Calcium citrate malate is a water-soluble calcium supplement. It is the calcium salt of citric acid and malic acid. It is purported to be highly bioavailable. Calcium citrate malate's bioavailability stems from its water-solubility and its method of dissolution. When dissolved, it releases calcium ions and a calcium-citrate complex. Calcium ions are absorbed directly into intestinal cells, and the citrate complex enters the body through paracellular absorption. Vitamin B6, also known as pyridoxine is a part of the B group vitamins and is water-soluble and is required for both mental and physical health. It is a co – factor in the cross linking of collagen chains in the bone matrix can reduce homocysteine levels, a risk factor in osteoporosis. High homocysteine levels are associated with an increase in bone loss. Homocysteine comes from the breakdown of one of the essential amino acids (methionine) and should, under normal circumstances, be detoxified by the body. Vitamin B6 has also been found to be deficient in people with hip fractures, and rats fed a Vitamin B6 deficient diet developed osteoporosis. Folic acid is quite essential for the body. It is a B vitamin which plays a major role in the synthesis, repair and replication of DNA. It is critical for cell division, nucleic acid metabolism and metabolism of glycine and methionine. It helps in maintaining the integrity and health of the skin. It assists the immune system and is needed for the proper functioning of immune cells. It plays a vital role in the production of red blood cells (RBCs). Folic acid also helps in relieving the pain and swelling due to rheumatoid arthritis. Methylcobalamin is the neurologically active form of the Vitamin B12 and has strong effect on the brain and nervous system being also very important for cell growth and production. Methylcobalamin (MeCbl), the activated form of Vitamin B12, has been used to treat some nutritional diseases and other diseases such as Alzheimer's disease and rheumatoid arthritis. As an auxiliary agent, it exerts neuronal protection by promoting regeneration of injured nerves and antagonizing glutamate-induced neurotoxicity. It improves bone mineralization; Vitamin B12 also prevents the inflammation of the joint. It does this by inhibiting the immune cells responsible for inflammatory reactions. Pregnant and lactating mothers should not take any single supplement in higher – than – normal doses unless recommended by a health – care provider for special conditions.